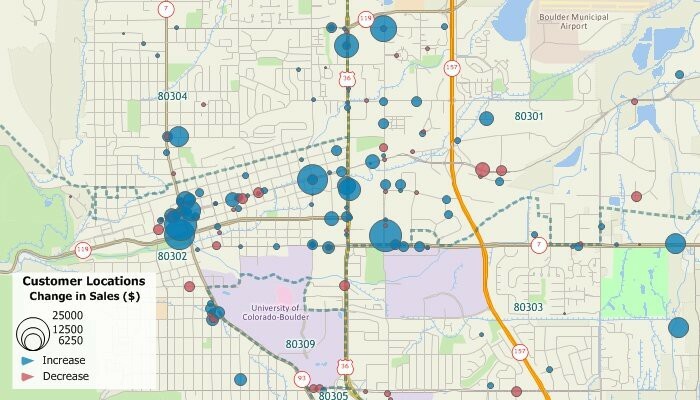 Maptitude provides ways for you to use maps to analyze and understand how geography affects you and your business. Maptitude is a powerful combination of mapping software and geographic data that provides everything that you need to make informed decisions and get the maximum return on your sales and marketing budget. 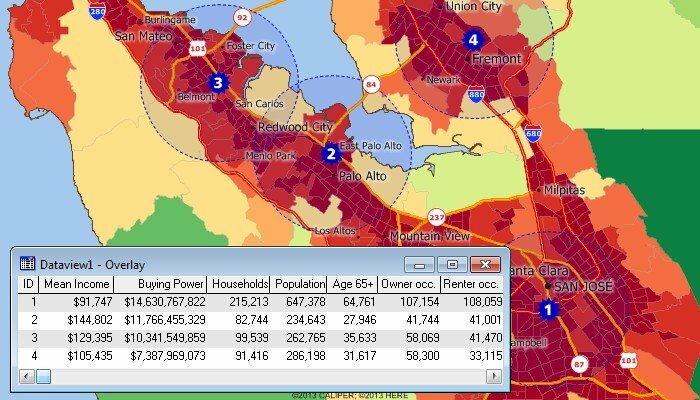 Maptitude includes substantial demographic and income data from the Census. Maptitude also includes easy-to-use analysis tools that will allow you to unearth the trends and information hidden in your data. Use the included Census demographic data to find the characteristics of the people who use your products. 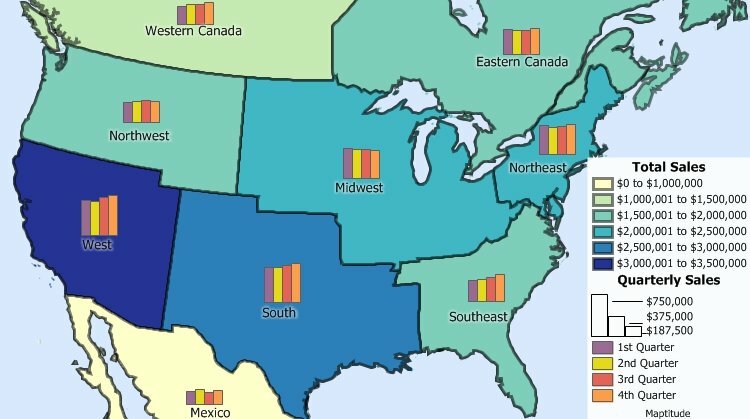 Create sales territories out of Postal/ZIP Codes, counties, states, or any other type of area, share territory maps, calculate the demographic characteristics of your custom territories, and attach your own data to them (Figure 3). For more information, see the Sales Territory Mapping page. Maptitude lets you create maps using your own data. Maptitude has direct access for a number of database, geographic, and raster file formats. In addition, you can access your data via ODBC from a number of data sources such as Access, Oracle, or SQL Server. You can also join and aggregate your data to any of the nationwide geographic files included with Maptitude such as states, counties, or Postal/ZIP Codes, or to your own custom territories. Maptitude for the Web is a specialized version of Maptitude for designing and running interactive map applications and location-based services on the Internet. Create a web-based interactive information system that allows your customers to find the nearest retail location. FIGURE 1: Analyze demographics and evaluate sites. FIGURE 2: Each country data package includes streets for the entire country with address and postal code ranges that you can use to locate your facilities and customers. FIGURE 3: Maptitude customer mapping software makes mapping sales and building sales territories easy. FIGURE 4: Find the Postal/ZIP Codes that have high income, large concentrations of people 18-34 years old, or any other demographics that you want to target with your marketing campaigns.